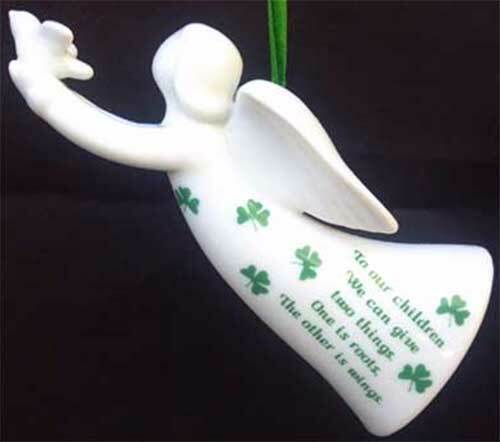 This Irish Christmas tree ornament is a white porcelain angel that is enhanced with a dove in her hands along with scattered green shamrocks on her gown and a blessing for children. The Irish blessing angel ornament measures 5" long x 2" tall x 1 1/4" thick; she is ready to hang on your tree with the included green ribbon. Irish angel Christmas ornament features a dove along with scattered shamrocks.